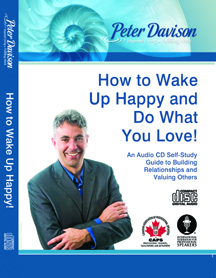 How to Wake Up Happy, and Do What You Love! Sixty percent of people sleep poorly at least 3 nights a week and yet we spend 1/3 of our life in bed (in an average life that’s 26 years!). The quality of your awakening determines the quality of your day, the quality of your days determines the quality of your life and your service to others. Bad sleep can impact decision making, stress coping abilities and the quality of relationships at home and work. You will learn how to prepare for a day to look forward with 7 steps to help you get up fresh and do what you love everyday. 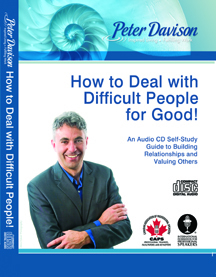 How to Deal with Difficult People for Good! When you listen to this CD you will learn how to know yourself better than the difficult person knows you (they at least know how to get “under your skin” without your permission). You will learn a profoundly simple tool to dissolve reactive energy and find harmony in all relationships so you can create and maintain quality connections with self and others as you choose.